Every year I create and design a holiday card. I had been doing an interpretation of “The Twelve Days of Christmas” for the past four years and the whole “golden rings” part didn’t seem fitting for this year’s greeting — especially in light with all that has been happening in this country and abroad. We live in a turbulent and uncertain world that often makes us feel uneasy and at times afraid. While I know in our hearts we are all kind people, fear can make it hard sometimes. 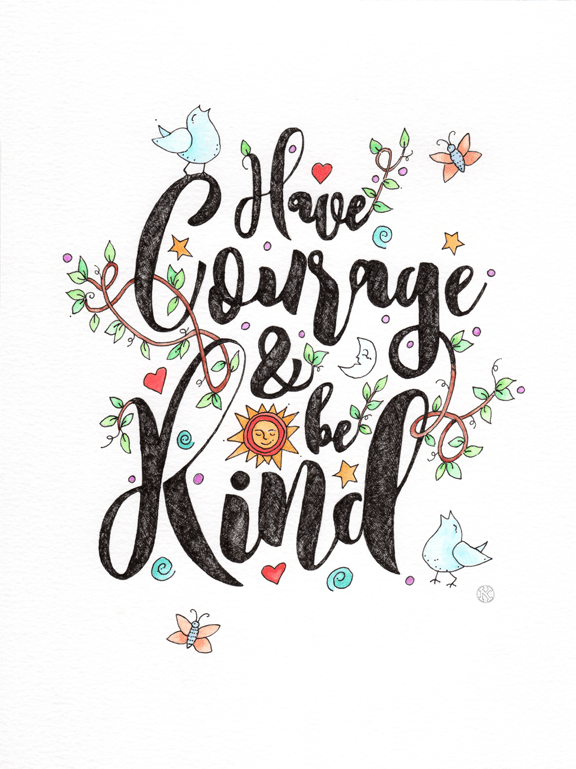 So this is my New Year’s wish for you: “Have Courage and Be Kind and Take Good Care of One Another.” I would also add please be kind to yourselves, too. It’s something we not so good at doing, but essential for some level of contentment, hopefully with bursts of happiness sprinkled in along the way. Blessings of peace, love, health and prosperity be with you throughout the New Year! Absolutely lovely! Can’t wait to get mine! Think I’ll frame it! A stunning piece of artwork, and a wise sentiment of words. Thank, Ms. Grand Ciel! I cherish my card. Thank you so much Debra! So glad you like it. Cheers and Happy New Year!